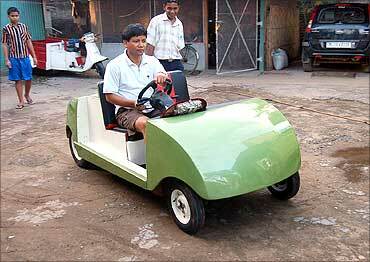 Rediff.com » Business » Will this be India's decade of innovation? Will this be India's decade of innovation? The National Innovation Council has been set up to herald a 'decade of innovation' in India from 2011-2020. The council, approved by Prime Minister Manmohan Singh, is the biggest government initiative to promote innovators across all sectors. So how far can India succeed in its attempts to boost innovation? If the Indian government evolves a consensus on various strategies to develop and leverage innovations from both formal and informal sectors, there could be infinite opportunities for India's young and talented innovators. The formation of a National Innovation Council is a step in the right direction if it actually evolves a model of innovation focussing on inclusive growth. In countries like Malaysia, New Zealand, there is a ministry focused on science, technology and innovation. In India, the council is still evolving and has a long way to go in terms of charting out a definite course of action. The first meeting of the council is slated for September. "Inclusion, expansion and excellence, as Dr Mashelkar (chairperson, National Innovation Foundation and member NIC) had put it, should be our aim. Our focus should be to harness the potential of both the formal and informal sectors. The NIC would take policy measures across all sectors formally to make a difference. I am hopeful that it would bring about a change that is much needed, to scale up and sustain innovations on the basis of their merit," says Prof Anil Gupta, member of the NIC and executive vice chair, National Innovation Foundation. Today, India's villages and small towns have emerged as the hotbed of innovation. Uneducated and illiterate people have won patents for a range of low-cost and effective products. Yet, we find many genuine innovators living in penury. Their innovations, which can make a profound impact in our societies, are still not utilised to its full potential. "It is high time we leveraged on these innovations and ideas. We need to create a series of processes which will ensure that our country learns from creative experiments being pursued in formal and informal sector and replicates them at local, regional or national level," says Gupta. However, the environment and ecosystem in India have improved over the years. The 13th Finance Commission has accepted the NIF's proposal to identify, document and promote innovations in public services across states. A grant of Rs 20 crore (Rs 200 million) has been recommended for the purpose and a Centre for Innovation In Public Systems is being created at ASCI, Hyderabad.. In addition, a second grant of Rs 1 crore (Rs 10 million) per district is allotted for the creation of District Innovation Fund. These steps could go a long way in helping the needy innovators. For innovation to be successful, it should be an evolving process across all private and public systems. "Many of our ordinary engineers have exceptional talent. We need to promote their capabilities. We should not have an elitist approach to development. For instance, the last time an IITian joined the ISRO was in 1983. We should look beyond IITs as well. Our focus should remain on the grassroot level innovations. Ideas are simmering all over and we should promote their ideas and make it sustainable," says Anil Gupta. The NIF has mobilised more than 140,000 innovations and traditional knowledge practices from over 545 districts of India, the largest database of its kind. Even Bastar district is a stronghold of innovation. But has its merits been explored? "Recently, student volunteers without much external support, established a portal of 104,000 technology student projects in techpedia.in. These can form the foundation to realize the Prime Minister's vision for innovation," says Prof Gupta. "The accountability of such experimenters should not be measured in terms of success in the outcomes but in terms of earnestness and novelty of effort and willingness to fail (that is to take risk). Unless we make investment in genuine failure, we will not succeed," says Prof Gupta. Will the National Innovation Council live up to the expectation of the innovators? Will genuine innovation be promoted and leveraged? Tell us your views and suggestions.